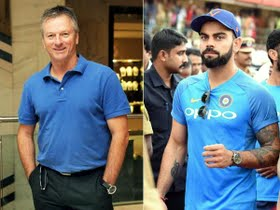 Aussie cricket legend Steve Waugh is the latest to join the Virat Kohli fan club. The former Test skipper opines that Kohli will break every batting record in the book, except Don Bradman’s Test average of 99.94. "He's got the passion and hunger, the fitness, the desire, the intensity and he loves playing the game. Unless he gets seriously injured, I think he'll break all the batting records barring Bradman's average," Waugh was quoted as saying by Cricket Australia, according to a Times of India report. Kohli recently became the fastest to 10,000 ODI runs, going past Sachin Tendulkar. He also has 38 ODI tons to his name, next only to again Tendulkar. Speaking of Bradman, he ended with an average under 100 as he was dismissed for a duck in his last international game against England in 1948.